Are you looking for a contemporary, clean update for your kitchen that won’t bust your budget? 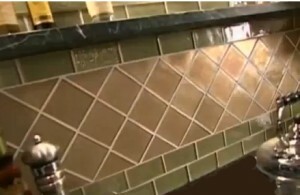 The video below will show you how to install a wall-tile kitchen backsplash. There are many clips on Youtube to select from that have installation instructions. This one will show you how to install a ceramic and glass tile combination on the wall extending between the counter and the bottom of your upper cabinets. Ceramic and glass tiles are beautiful and available in many different colors. They are also very easy to install. The video below gives professional tips on how to install glass tiles for splashbacks between your counter and kitchen cabinets. Creative ideas like this make kitchens stand out from the ordinary. You are going to need a few tools, a little time and a fair amount of money. These little glass squares are not necessarily a reasonably priced item. The materials used in this clip come from recycled bottles, supplied by Ocean Side Glass. They are available in many different colors, textures and finishes. There’s a really nice blend of different colors when you select granite backsplashes for your kitchen. This is why you can match the material with so many other things in your kitchen design. As an example a marble pattern that has grey white and variations of brown and umber will go well with dark wood cabinets and white countertops. Designing your kitchen around granite is a great way to pull everything together.